Carla has been doing a 60 day challenge at her gym that involves a new exercise routine, as well as a good number of changes to her diet. The new diet has been an exciting change of pace for me, as the challenge to work within her diet’s parameters has produced some delicious dishes. An added level of difficulty is that the diet changes slightly over time, so it requires a bit of adapting on my part when the dietary guidelines change. The first week was all about lowering the stored glycogen in the liver, so the foods were primarily low in carbs and high in protein. 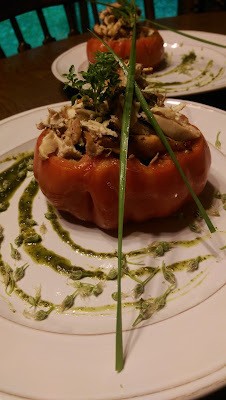 My favorite dish for this week was an heirloom tomato filled with a base layer of pureed mushroom, then topped with hickory smoked chicken breast and Welsh scallion. Cilantro oil added the necessary healthy fat, along with great color and flavor. This diet has also been an education in food nutrition for me; a large tomato is low in carbs, while a handful of string beans are much, much higher in carbs. On the healthy fat side, I’ve also become much more comfortable in making a wide range of infused oils. Just blanch a large handful of herbs for 10-15 seconds, then plunge into an ice water bath. Buzz the herbs with an equal amount of olive oil in a blender for 30-45 seconds, then strain out the woody bits and stems. Coconut oil continues to elude me. I know many people swear by it (even half of Outkast was featured in Bon Appetit for using it to saute collard greens), but I find it very limited in use. I buy unrefined coconut oil, and it imparts a very strong coconut flavor to dishes. 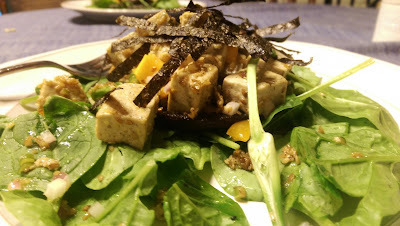 Its fine for curry or a Thai dish, but the coconut flavor overwhelms many other dishes. Perhaps refined coconut oil would be a better choice, but due to the heat treatment and stripping of nutrients that occurs in an oil refinery I think I’d get the same health benefits from buying canola oil at half the price of refined coconut oil. Initially my major concern with doing a diet like this was pricing, as protein can be expensive. But I found that organic chicken was about half the per pound price as a 4 oz protein bar, which could range from $2.75-$3+ per bar, or $11+/lb. Surprisingly fish was one of the solutions that we have been very happy with. IQF, or Individual Quick Freezing, technology has allowed frozen fish to reach new heights of flavor retention. 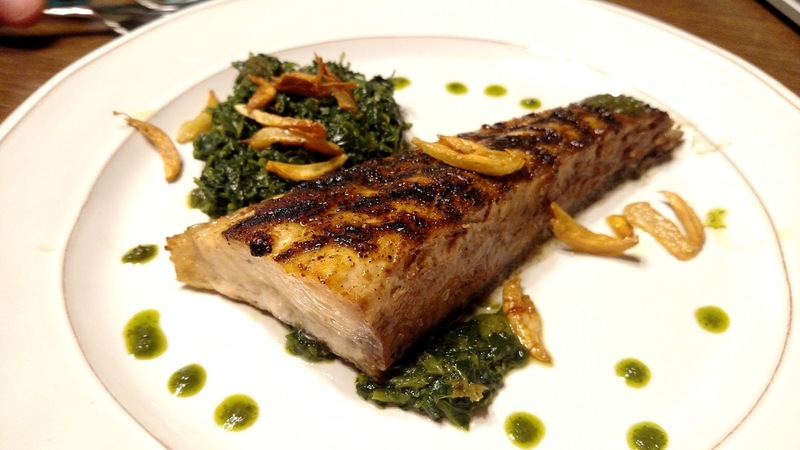 For $4.49 a person, we had wonderful mahi mahi filets that had none of the watery texture or strong fishy flavor typically associated with frozen fish. As the challenge progressed, we began to use new ingredients with higher carbs, but high-carb/high-fat items like nuts, nut butters, and avocados were still off the shopping list. 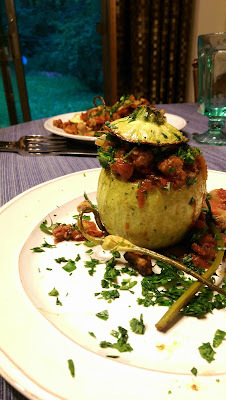 To be honest, I loved the vegetable-bowl idea, as it really filled out the plate and allowed for a very satiating portion. Now that summer squash and zucchini were available, I hollowed out a globe zucchini and filled it with a mixture of grass-fed beef, tomatoes, grilled garlic scapes, and infused oil. At this point, we’re nearing the finish line and the local PA farmer’s markets are in full swing! With increasing exercise intensity Carla has a higher carb count available, so I’ve been able to introduce items like beans and artichokes. Taking a nod from haut cuisine, I’ve found that a plate of small portions of several mixed vegetables is much more exciting than one scoop of a single varietal. 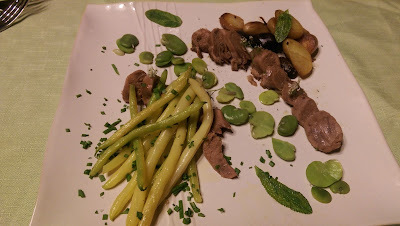 Carla’s recent favorite was poached goat tongue served with a mix of wax beans with chives, fresh fava beans, fried sage leaves, and heirloom fingerling potatoes. Rich, chewy tongue, crunchy yellow beans, delicate favas, and crispy/creamy potatoes made for a tour de force of flavors and textures.